Callum Connolly insists 10th place does not flatter Latics at the first international break of the season. The League One champions have hit the ground running in the Championship, with three wins and a draw giving them 10 points from their first six games. And Connolly says, if anything, it could be even better. 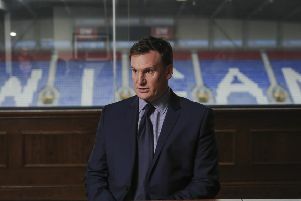 “I wouldn’t say we’re ahead of where we expected to be,” he told the Wigan Post. “At the start of the season, when the games began, we all knew what was expected of us, and what we were capable of. “We’ve dropped a couple of points late on in games, we should really have another two or three points on the board. Everton utility man Connolly is enjoying a successful second loan spell with Latics, having previously been part of the side that suffered relegation to the third tier on Warren Joyce’s watch two seasons ago. The 20-year-old has returned to the DW Stadium a far more rounded player, having spent last season on loan with Ipswich, where he played predominantly in a midfield role. And he says the squad he’s returned to – while including some familiar faces such as Will Grigg, Dan Burn, Michael Jacobs and Nick Powell – is far better equipped to survive, and hopefully prosper, than the class of 2016-17. “Obviously there’s a lot of new players since two years ago, it’s a very good squad and we’re looking to kick on,” he added. “There’s definitely a better squad than last time – in terms of quality and depth, to be honest. All 22 of us can do a job and that gives the manager great options as we look to kick on. “I’m certainly a lot more rounded player. I had a very good time at Ipswich last year which brought me on a lot.